Background: Aqueous leaf extract of Bryophyllum pinnatum is gaining popularity because of its many ethnomedicinal uses. The extract is often used for chronic conditions such as hypertension by alternative medical practitioners. Earlier we studied its acute and sub-acute toxicological profile. Here we evaluated its sub-chronic effects on some gross toxicological, biochemical and haematological parameters in rats. Materials and Methods: Adult Sprague-Dawley rats of both sexes were used. The animals were given oral doses of 0.5 or 2.5 g/kg/day of the extract for 90 consecutive days. Controls were sham-treated by administering distilled water for the same period. Whole body weight, terminal organ weight, litter number and weight were recorded. Aspartate aminotransferase (AST), alanine aminotransferase (ALT), gammaglutamyltransferase (GGT), Na+, K+, creatinine and haematological indices were assayed in the animals. Results: There were no significant differences in weight, organ-to-body weight ratios and litter numbers across the groups but mean litter weight was significantly lower in the extract-treated groups. Values of haematological parameters were also comparable except for a significant decrease in PCV in the 2.5 g/kg/day group. ALT values were significantly reduced in the extract-treated groups but AST values decreased significantly in the 2.5 g/kg/day group. The levels of GGT were significantly elevated in the extracttreated groups. Na+, K+, creatinine and urea levels were comparable across the groups. Conclusion: Sub-chronic administration of high doses of the aqueous leaf extract of B. pinnatum seems to be safe although more data are required to further confirm this. Malignant lesions, reactive hyperplasia and tuberculosis were the commonest pathologies of enlarged lymph nodes. Malignant lesions especially metastasis should therefore be considered in lymphadenopathies presenting in the Niger Delta region of Nigeria and biopsy of all cases should be encouraged. Provision of immunohistochemistry and other molecular pathology resources in our centre will obviate limitations in pathological studies. Objectives: Several studies have related deficient plasma levels of fat-soluble vitamins to increased prevalence of metabolic syndrome and suggested that optimal levels may reduce the risk and progression of metabolic syndrome. This study was designed to assess the plasma concentrations of vitamins A, D and E in Nigerians with metabolic syndrome. Materials and Methods: One hundred metabolic syndrome subjects were recruited into the study; 55% of them had type 2 diabetes. One hundred controls were age- and sexmatched. Blood pressure, body mass index, waist circumference, concentrations of plasma glucose, lipid profile, vitamins A, D and E were estimated. Results: The mean plasma vitamin E of metabolic syndrome subjects was significantly lower than that of controls (P=0.0001) and also lower in subjects with diabetes than in those without diabetes (P=0.006). The mean plasma vitamins A and D of subjects were similar to that of controls (P=0.231 and 0.391 respectively) and also similar in subjects with and without diabetes (P=0.134 and 0.061 respectively). Mean values of vitamins A, D and E in subjects and vitamins A and D in controls were suboptimal. Conclusion: Plasma vitamin E was lower in subjects with metabolic syndrome than in controls, and vitamins A and D were similar but suboptimal in both groups. This may be due to inadequate vitamin intake, increased oxidative stress and inflammation among other factors. Background: Inefficient laboratory utilization occurs when requests are made and reports are not retrieved. This study aims to determine the pattern of report retrieval in pathology laboratories in Nigeria and ways to improve current practice. 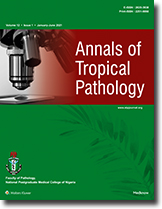 Materials and Method: All un-retrieved histopathology and cytopathology reports in histopathology laboratories of Aminu Kano Teaching Hospital, Kano and University of Port Harcourt Teaching Hospital, Port Harcourt between January, 2009 and December, 2009 were retrieved from archives. From these, final diagnosis and turn around times were determined. Questionnaires were also distributed to determine reasons for failure to retrieve pathology reports. Results: A total of 1,096 (22%) histology reports and 319 (12%) cytology reports were not retrieved in AKTH while 4% of histology and 20% of cytology reports were not collected in UPTH. The uncollected reports exhibited malignancy or positive resection margins in 14% and 18% of histology reports in AKTH and UPTH respectively and 16% and 18% of cytology reports in AKTH and UPTH respectively. The turnaround time (TAT) for the histology and cytology cases in AKTH were approximately 4 days and 36 hours respectively, and in UPTH 5 days and 3 days respectively in about 80% of cases. Questionnaire respondents (57%), felt histology was associated with long TATs while 51% disagreed that cytology had long TATs. Reasons for failure to collect reports were long TAT (46%); poor awareness by patients (36%) and patient death (28%). Respondents felt the best methods of report dissemination were by laboratory dispatcher (57%) and intranet (31%). Conclusion: This study concludes that optimal pathology laboratory utilization requires constant communication between clinicians and pathologists and shows the need for specific hospital-tailored framework for pathology report retrieval and dissemination.